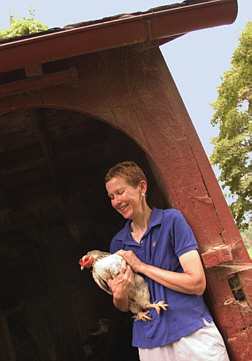 For Mary Wippel, a clinical nurse in the Hopkins emergency department, raising chickens is familial. "My mother, as a kid, was in charge of the henhouse, and my sister in Texas has had chickens for almost 40 years. So when I bought this house, which has a barn, the first thing I did was fill the barn with chickens." Wippel has been raising fowl for 25 years now at the house with the barn, in rural Darlington, Maryland, northeast of Baltimore. First she intended to sell eggs, but profits proved elusive. "Then I started going to county fairs, and became interested in different breeds and in breed conservancy." She began raising Buff Cochins, Black Cochins, Partridge Cochins, Buff Orpingtons ("very nice birds . . . long-lived, they hold their feathers . . ."), Brahmas ("a big Asian chicken"), Auracanas ("the ones that lay pink or blue eggs"), and various crossbreeds. Her favorite breed is Cochins, which come in nine color varieties including Buff, Blue, and Silver-laced. "They're my favorite because they're very gentle, quiet and calm, not skittish, and friendly. I had a Buff Cochin that would follow me around at night. She would follow me back from the barn, or ride on my foot when I walked." Wippel isn't sure how many birds currently wander her property because there are more all the time. Some of the hens, "her girls" as she calls them, keep disappearing for a few weeks, only to return with new broods of chicks. "This year, three of the girls went on the lam," she says. "They always show up back home after they've been bad."